GUWAHATI, India — Every year we hear about India’s much-touted ‘Act East Asia’ policy and how it will catapult the country’s northeastern region into the international market, connecting Myanmar and the rest of Southeast and East Asia and beyond. The Act East Asia (AEA) policy, which was rechristened as such in 2014 from the earlier ‘Look East Asia’ policy after the ascension of Narendra Modi as the country’s 15th prime minister under the Bharatiya Janata Party (BJP)-led government, does not have much to show in terms of actual achievement, except that it has continued to play up the importance of inter–regional connectivity and linking northeast India to Myanmar, Thailand, other ASEAN countries and China. Without any malice intended, it must be said that apart from the tall talks of connectivity, the only thing that has been visible is grand events hosted by Indian Prime Minister Modi, such as the hosting of the 10 ASEAN leaders as chief guests at India’s 69th Republic Day Parade on February 26 this year. Prior to that, Modi invited all of the South Asian Association for Regional Cooperation (SAARC) leaders to his swearing-in ceremony in May 2014. The BRIC (originally Brazil, Russia, India, and China, before the induction of South Africa in 2010) summit in October 2016 also saw an outreach summit organized with all seven leaders of BIMSTEC (Bay of Bengal Initiative for Multi-Sectoral Technical and Economic Cooperation). Besides these events, Prime Minister Modi has not left any stone unturned to organize grand road shows at home for leaders from China, Japan and, most recently, Israel, who visited India in the past four years, and also to spice up his frequent foreign visits with huge get-togethers with India’s diaspora abroad. After so much showbiz, it is only natural that just about everyone – at least in Northeast India – is asking “how has all of this helped AEA achieve its objectives,” and more importantly, where does Northeast India fit in all of this? The Modi-led government has been especially loud about how the government had planned to make Northeast India the most sought after business and tourist destination with the rolling out of the AEA policy. Thus, while the BJP gears up for general elections early next year, calls asking what AEA has achieved are gaining momentum. The AEA promises a lot at least on paper. It aims to focus on the extended neighborhood of the Asia-Pacific region. The endeavor, according to India’s ministry of external affairs, “promotes economic cooperation and cultural ties, and develops strategic relationships” with countries in the Asia-Pacific region through continuous engagement at bilateral, regional and multilateral levels. The other perhaps more crucial feature is that the policy would help in providing enhanced connectivity to the states of the Northeastern region including Arunachal Pradesh with other neighboring countries. This was emphasized recently by India’s External Affairs Minister Sushma Swaraj in a meeting with the chief ministers of all of the northeastern states. But what is perhaps missing from New Delhi’s list of ‘do’s’ is the political will and the willingness to translate its plans into action, at least insofar as the northeast is concerned. This is perhaps because India’s northeastern region, which comprises the states of Arunachal Pradesh, Assam, Manipur, Meghalaya, Mizoram, Nagaland, Sikkim and Tripura, is extremely complex, given its enormously diverse ethnic composition and distinctly different cultures from the rest of India, as it shares an international border of 5,182 kilometers (about 99 percent of its total geographical boundary) with neighbouring countries such as China, Myanmar, Bangladesh, Nepal and Bhutan, making it an exceptionally important geo-strategic space. India surely does not want to make any mistake, especially regarding the security of the region. It has been a hotbed of insurgency, cross-border militancy, migration issues and extreme forms of communal violence – making the area a prime concern and a top priority. It would also be wrong to say that the need to engage the northeastern states has not been felt by the Indian establishment in New Delhi since its Look East policy which was launched in 1991 by the then Congress Prime Minister P V Narasimha Rao. Following that, the BJP government under Atal Behari Vajpayee and the subsequent Congress-led government under Dr. Monmohan Singh took it forward. However, with few gains since then, it was renamed the Act East policy by Modi in 2014 after he took over as prime minister and he placed emphasis on engaging the northeastern states in order to unlock the vast potential of the region. 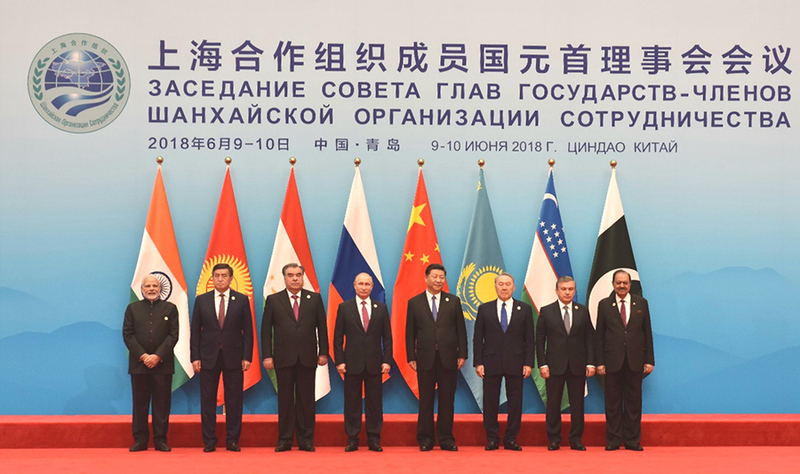 Indian PM Narendra Modi with other global leaders at the Shanghai Cooperation Organization (SCO) Summit held from June 9-10, 2018. / Ministry of External Affairs India. However, efforts to involve these states have been piecemeal to say the least, with occasional exchanges and visits from chief ministers and junior ministers and some India-ASEAN motor rallies through Myanmar ending up in Malaysia or Singapore. There has not been a concerted effort to engage even the key states of Manipur, Nagaland, Mizoram or even Assam in any of the business conclaves that have been held either in New DelThe recent meeting of the northeastern chief ministers with India’s external affairs minister Swaraj made up for some lost ground, as most of the chief ministers that attended the meeting voiced their concerns. A laundry list of what needed to be done was handed over to Swaraj, including a need to address the issues that confront the people of the northeast, to build better connectivity within the states that make up northeast, and to display cautiousness in handling security issues involving the Indian military establishment and the various insurgencies in the region. Soon after the meeting with Swaraj, chief minister of Meghalaya State Conrad Sangma wrote to the former reminding her that the Northeast states need to be kept at the heart of the Act East policy. In his letter to Swaraj, the Meghalaya chief minister floated the idea of all eight chief ministers of the northeastern states traveling together in a bus to the neighboring countries of Bangladesh, Bhutan and Myanmar. “Along this journey the chief ministers and officials can interact with civil society groups, farmers, youth and the people of these countries,” the chief minister said. Meghalaya Chief Minister Sangma who heads a BJP supported coalition government admits that on the ground “there is more that needs to be done.” In a recent interview with The Irrawaddy held at Shillong he said, “To be fair to the whole thing is not easy. To get all the states of the Northeast along with the countries in ASEAN and BIMSTEC together with Nepal and Bhutan there is a challenge at a very high level.” The Meghalaya leader also pointed to “intra-regional and intra-state politics,” stating that in his view these complicate the situation further. “Let us not forget that though the similarities are there, there are also differences among us in this region. There are challenges and a lot of work needs to be done,” the young political leader from Meghalaya said, perhaps echoing other chief ministers of Northeast India.